After years of planning and preparing, we are pleased to finally announce the launch of a SPUR office in Oakland. It’s a big step for us and, we hope, a big milestone for the region. As the first director of SPUR’s Oakland office, I am thrilled and honored to be in a position to help make it happen. With 406,000 residents and 210,000 jobs , Oakland is the third largest city in the Bay Area. It’s the center of the BART network, with eight stations, and it’s the home to the region’s container port. Oakland’s manufacturing sector extends from crafters of beer to makers of Rolls Royce engines. Simply put, Oakland is one of the most diverse and complex cities in America. As regionalists, we confront the paradox that local governments make most of the big regional decisions in the Bay Area, in particular the decisions about where and how to grow. That means the path to helping influence the evolving shape of the region lies through in-depth work at the city level. Our first step in this strategy was to open a SPUR office in San Jose, which we did in 2012. An amazing group of civic leaders recruited us, and we decided to treat it as a pilot project to test the idea of carrying out our work across a broader geography. The pilot succeeded beyond our expectations, and once we had established a thriving base in San Jose, we were ready to expand our presence to Oakland. With early support from the S. D. Bechtel Foundation, the Wallace Alexander Gerbode Foundation and the Clarence E. Heller Charitable Foundation, we began comprehensive strategic planning and set out to meet with as many people as possible to learn everything we could about the city of Oakland. Oakland has a set of incredible assets: eight BART stations, direct rail service to Sacramento and San Jose, and AC transit; a walkable urban street grid; more affordable housing than San Francisco and San Jose; a fantastic network of parks; an engaged, sophisticated citizenry; a nationally significant art, restaurant and nightlife scene; a robust manufacturing ecosystem; developable land within walking distance of transit; and anchor institutions like the Port of Oakland (the fifth largest in the nation), among many others. At the same time, Oakland faces challenges. 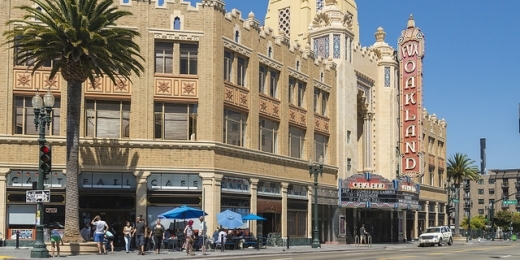 It is perched in a paradoxical and highly charged position, dealing with problems of serious poverty — not enough economic opportunity for its residents, not enough money to cover basic public services — while simultaneously facing fears of rising rents and displacement as job growth in the broader region creates spillover demand for housing. Oakland urgently needs to strengthen the capacity of its public sector to provide public services, to come up with strategies for long-term affordability, and to figure out new approaches to public safety. Finding a way to support Oakland would be an enormous win, for the social equity movement as well as for smart growth. SPUR enters into this work with great humility. We have a lot to learn, and look forward to partnering with and learning from people who know and love Oakland. We also know that in 105 years of policy work, we have learned something about how to make successful urban places, and that this knowledge can be useful in helping Oakland reach its goals. SPUR works to be a practical, non-ideological organization, and we look forward to being in dialogue with the entire spectrum of passionate viewpoints about the future of Oakland. The organization will provide research and technical assistance when called on, and a neutral meeting ground for an exchange of ideas when needed. We will bring a regional perspective to bear on the issues Oakland faces, and we’ll elevate the role of Oakland in regional decision-making. We hope to be part of a movement of Bay Area cities who are together trying to invent a new form of urbanism that will provide a sustainable, high-quality life for all. I hope that those of you who have been SPUR supporters for a long time are as excited about this as we are. We will need all of your support, patience and humor as we grow into our new model. We couldn’t do this without you. Now, we are excited for the next step in our journey. Robert Ogilvie is SPUR’s Oakland director.